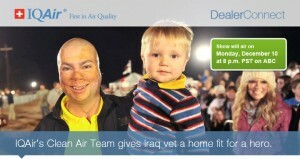 IQAIR’s Clean Air Team gives Irag war vet a home fit for a hero! Staff Sgt. Shiloh Harris was on patrol in Iraq in 2007 when an improvised explosive device (IED) struck the vehicle in which he was traveling. His face and more than 40% of his body were badly burned. Despite his devastating injuries, Harris refused to leave the scene until every member of his patrol team was accounted for. Back home near San Antonio, Texas, Harris began a long and painful recovery process while dedicating his time to giving hope and inspiration to other wounded veterans. But exposure to coarse and fine dust, germs, viruses and other airborne pollutants was a constant threat to Harris’ health. That’s when the designers at the ABC-TV hit show “Extreme Makeover: Home Edition” stepped in. For a hero in need of the cleanest air possible, the Extreme Makeover designers called in the IQAir Clean Air Team! IQAir and Extreme Makeover worked together to create one of the healthiest homes in America for Sgt. Harris and his family. Be sure to tune in and see how IQAir and hundreds of volunteers and celebrities worked together to finally give Sgt. Harris and his family a fitting welcome home for the holidays. CLICK HERE to learn more about IQAir on Amazon!